Atlanta Real Estate Forum congratulates Berkshire Hathaway New Homes Division and Marketing Results for winning a Gold OBIE for the Best Marketing Campaign/Promotion – Builder – Budget under $10,000 category for the grand opening event at Wescott. Presented by the Atlanta Sales and Marketing Council, the OBIE Awards are the premier awards given in the Atlanta new home construction industry. Wescott is located across the street from award-winning Lambert High School and offers luxury homes with all the latest in new home design. The homes are priced from the mid-$600s in sought-after south Forsyth County. The community will be gated and will offer a community clubhouse, swimming pool, tennis courts, and fire pit. 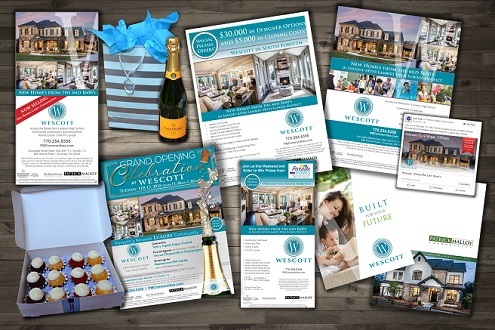 The grand opening promotion for the newly decorated model at Wescott was designed to introduce the Realtors and the local community to Wescott. The promotion needed to be cost-effective for this was an introduction promo to generate pre-sales before the inventory specs had begun. Wescott was the first luxury community priced at $600,000 and up for Patrick Malloy Communities, so the look needed to be upscale. Also, to entice the luxury real estate agents to visit, the marketing team needed a pull. Hand-delivered invitations of Wescott-labeled champagne with an invitation card attached and boxes of fabulous bunitinis to enjoy with the champagne were delivered to targeted real estate office, where they provided a great WOW factor. With Feb. 13th being Fat Tuesday and to provide an interesting twist, the menu for the event was upscale Cajun Cuisine with champagne. The invitation and flyer were designed in silver, gold and the community blue and promoted the first 10 Realtors to the event would receive a bottle of Veuve Clicquot Brut Champagne, a $50-plus bottle of champagne. This was a huge hit, with top luxury agents at the door at 11:30. Many of the agents stayed a long while and ahh’d over the decorated model, allowing the team to communicate all things great about Wescott. The Realtor event was a huge success with 80-plus top-notch luxury agents in attendance. Agents left with two Wescott champagne glasses and great perception of the Wescott community. The consumer event was held late afternoon the same day to help with the rental and food costs. 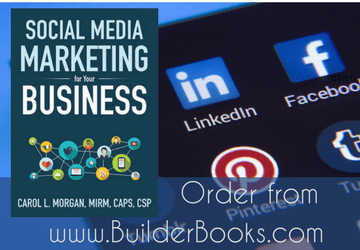 The local consumer market was invited via an ad in the local neighborhood newspapers and a Facebook ad campaign that targeted the area and price points. The same rentals, flowers, signs, and caterer were used, helping to reduce costs. Cajun-styled appetizers and champagne was offered to the consumers. The promotion was able to generate 50-plus consumers to the grand opening of the model that day. Guests registered for drawings allowing the agents to gather information for later follow-up. The decorated model grand opening promotion proved a huge success with 130-plus visitors to the community for the event. For more information, visit pmcommunities.com.